Red Embrace: Hollywood—What Vampire House do you belong in? 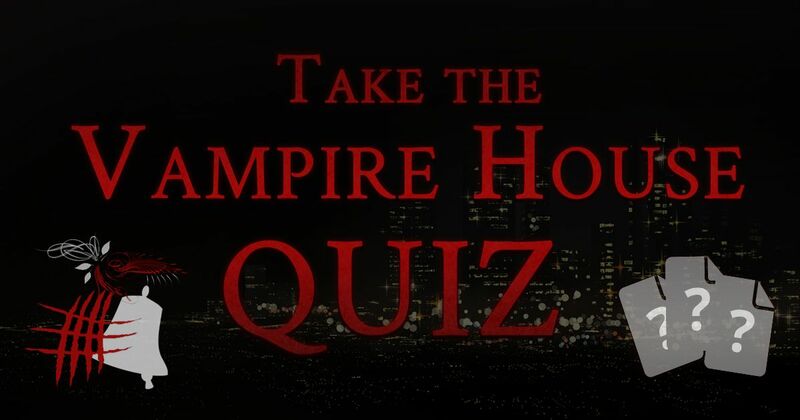 What Vampire House would you belong to in Red Embrace: Hollywood? Take this quiz to find out. Learning about the world--reading, watching, listening. You're being held hostage by gangsters. How do you escape? Persuade or seduce one of the guards to let me go. Break out of my bindings and destroy them all. I'm not trapped here with them--they're trapped here with me. Always lost in a daydream. Someone insults the person you love most. How do you react? Angrily jump to your loved one's defense. Calmly point out the attacker's own flaws. Say nothing. They can defend themselves. What do you find most attractive about vampires? The thrill of becoming something beyond human. The dark world of secrets and intrigue that surrounds them. The world is a cruel, lonely place. What keeps you going day by day? The love of my family and friends. Finally, what comes to mind when you hear the word "Hollywood"? "You and I, we're not that different after all. You're a little sick, as am I—that's what they tell us, anyway." Your desire for knowledge and attraction to the darkness makes you a perfect Golgotha vampire. 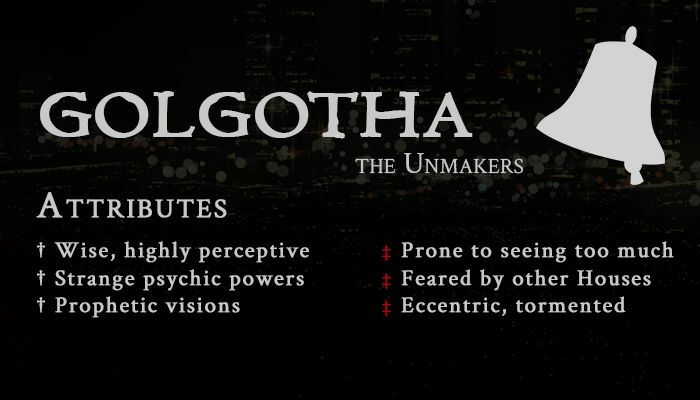 No one truly understands the Golgotha, not even themselves.With unnatural wisdom and intuition, these vampires often see what others cannot—the secrets of the present and future. But as their insight strips away the world’s comforting veil, many Golgotha become warped, haunted by both reality and their own visions. When you enter Hollywood, what dark secrets will reveal themselves before your eyes...? "That light in your eyes reminds me of arson, angry and wild." 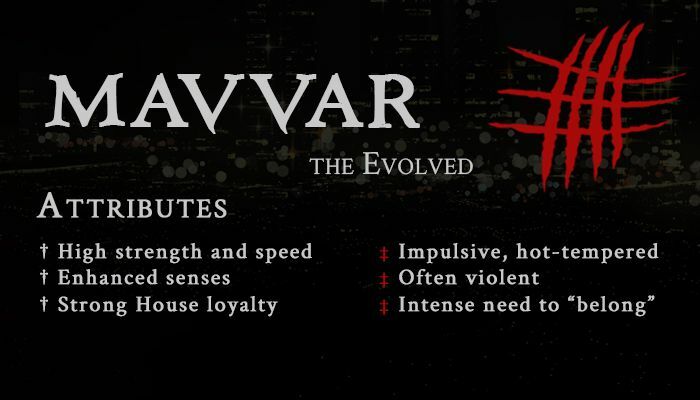 Your fierce loyalty and impulsive nature makes you a true Mavvar vampire. Beasts as much as humans, the fiery Mavvar have physical gifts beyond imagination. Bonded by their feral vampiric natures, they often form diverse, tightly-knit “clans.” However, this primal mindset can also be their undoing. A Mavvar without clan or cause is eaten away by loneliness. But even within a clan, mob mentality can make them destructive. When you enter Hollywood, will you retain your humanity, or succumb to the feral beast growing inside you...? "Far too pretty for a dead thing—a lovely face doesn't hide the rot inside." 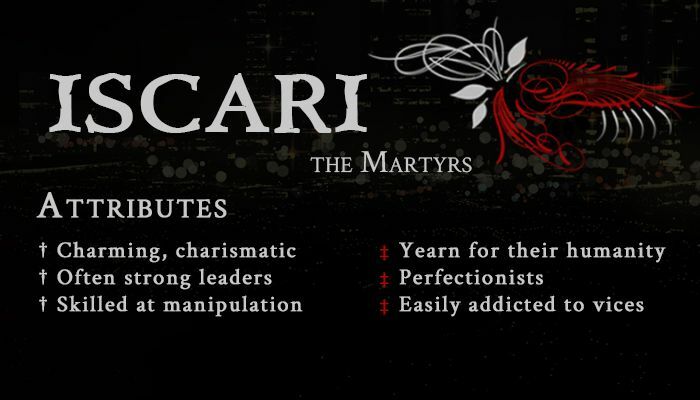 Your artistic, emotionally sensitive nature is a perfect match for most Iscari vampires. Dazzling creatures of the night, the Iscari are as beautiful as they are damned. Often artists, politicians, or actors in life, they keep their dreams and passions in undeath. Yet this humanity is a double-edged sword. Unlike the other, more detached Houses, Iscari vampires are driven to chase their old human desires—whether for love, excitement, or power. When you enter Hollywood, will you retain your humanity, or will you indulge in a dark world of new vices...?